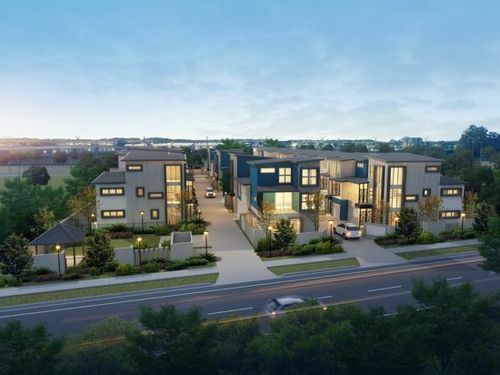 The Townhouses include contemporary designed three bedroom, one study, three bathroom and double car garages. Previously had DA approval for 62 apartments, so it can be changed to an apartment site if desired. 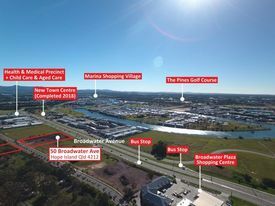 With a land area of 7,367m2 this north facing development site within Gold Coast's North Shore Precinct is sure to impress. Already connected to all services including roads, water, sewerage, storm water, power and communications. It has two street frontages with bonus block on the other side of Halcyon Way, and another to Broadwater Avenue the main arterial linking Hope Island to the Pacific Motorway. This site's location is undeniably superb with conveniences and amenities right at its doorstep including shopping, entertainment, restaurants, schools, parks, medical centre and serviced by public transport. -	3min walk to Broadwater Avenue at Crescent Avenue Bus Stop - 210m. -	3min walk to Kids Academy Hope Island Early Education and Care -220m. -	3min walk to Arcare Hope Island Aged Care - 240m. -	3min walk to Broadwater Avenue Park - 270m. -	3min walk to Broadwater Plaza Shopping Centre - 290m. 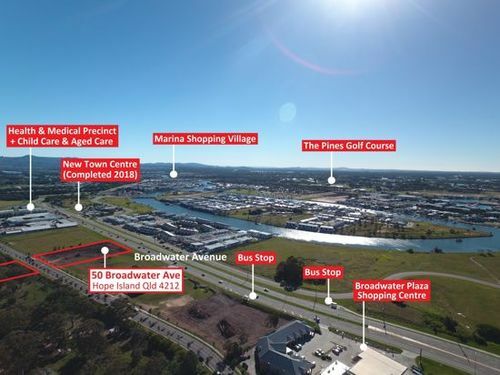 -	4min walk to Health & Medical Precinct including Hope Island General Practice, Queensland X-Ray, Pharmacy, Pathology, Dentist, Physio, Podiatry and Specialists - 300m. -	5min walk to Bonny Babes Child Care Centre Hope Island - 450m. -	6min walk to the newly opened Hope Island Market Centre including Woolworths, Aldi and a variety of dining & specialty stores - 450m. -	6min walk to Hope Island Tavern - 450m. -	4min drive to Marina Shopping Village. 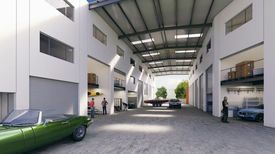 -	5min drive to Paradise Point Shopping and Retail Precinct. -	5min drive to Coombabah State School. -	7min drive to Helensvale State High School. -	7min drive to Marine Village Sanctuary Cove. -	8min drive to Pacific Motorway M1. -	10 - 12min drive to Gold Coast Theme parks. -	26min drive to Surfers Paradise. -	45min drive to Brisbane CBD. The Gold Coast is the sixth largest city in Australia and to meet its rapidly growing population approximately 8,000 new dwellings per year are required. New residential supply is at extremely low levels and including the vacancy rate of under 2% the Gold Coast desperately requires new housing stock. 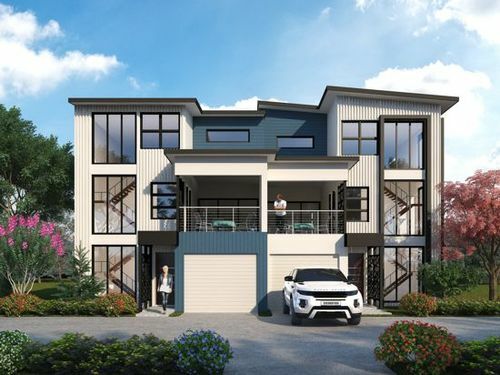 Hope Island itself is located in the Gold Coast's northern growth corridor which is one of the fastest growing regions in Australia surrounded by mostly prestigious homes on or off the waters. All information contained herein is gathered from sources we consider to be reliable. However, we cannot guarantee or give any warranty about the information provided, interested parties must solely rely on their own enquiries.